Let's add two more activities to our example: procurement and material handling. The costs of these two activities are not caused by—nor do they correlate with—machine hours. Rather, we will assume that both of these activities are related to the physical weight of the direct material used in making the product. A product that weighs 0.5 pound and is produced in a batch of 50,000 units at a rate of 50 per hour. A product that weighs 1.5 pounds and is produced in a batch of 50,000 units at a rate of 50 per hour. No activity based costing allocations—all manufacturing overhead costs are allocated entirely via machine hours. 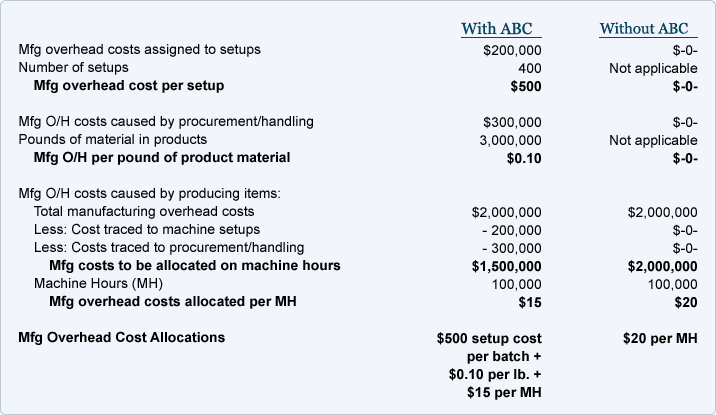 If the manufacturing overhead costs are caused by a number of activities such as setup, procurement, handling, and production, then using the activity based costing method of determining costs will give you a result that is closer to the true costs. As you can see, the product that weighs 0.5 pound is assigned $0.36 of manufacturing overhead, while the product weighing 1.5 pounds is assigned $0.46 of manufacturing overhead. Under the traditional costing allocations the procurement and handling costs would be assigned on production hours. Keep in mind that whenever manufacturers have a diverse lineup of products, allocating costs on a single basis (such as machine hours) will result in inaccurate per-unit manufacturing overhead costs. 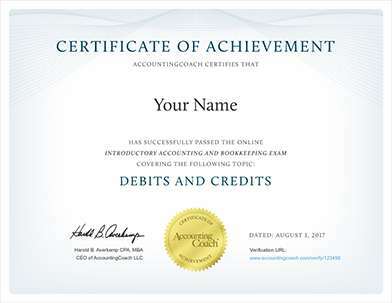 Note: You can receive instant access to our PRO materials (visual tutorials, flashcards, quick tests, quick tests with coaching, cheat sheets, video seminars, bookkeeping and managerial guides, business forms, printable PDF files, and progress tracking) when you join AccountingCoach PRO. You should consider our materials to be an introduction to selected accounting and bookkeeping topics, and realize that some complexities (including differences between financial statement reporting and income tax reporting) are not presented. Therefore, always consult with accounting and tax professionals for assistance with your specific circumstances.